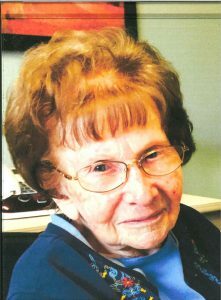 Henrietta Schmidt, 99, of Schuyler, died Sunday, October 22, 2017, at Brookstone Acres In Columbus. Funeral Service Thursday, October 26, 2017 10:30 A.M.
Henrietta was born February 3, 1918, in Colfax County to Henry and Effie (Fuhr) Foust. She received her education in Colfax County Schools. On April 8, 1947, she married Glenn Schmidt at the First Presbyterian Church in Schuyler. They farmed near Fort Calhoun for two years and returned to Schuyler where they lived and farmed the reminder of their lives. Henrietta was a homemaker and loved gardening and caring for her flowers. She enjoyed travelling with Glenn and her greatest love was her grandchildren and great-grandchildren. She was a member of the First Presbyterian Church for well over 50 years as well as the Rebekah Lodge and Eastern Star. Surviving Henrietta are her two daughters; Elizabeth (Lyle) Dostal of Gretna, Glenetta (Chuck) Misek of Schuyler, eight grandchildren; Christopher (Michelle) Schmidt, Jesse Schmidt and Jodi (John) Schmidt all of Columbus, Jonathan (Carrie) Dostal of Alexandria, Virginia, Nicholas (Leslie) Dostal of Omaha, Chuck (Kiley) Misek, Marshalltown, Iowa, Ryan (Casey) Misek of Elkhorn and Rosemarie (A.J.) Runge of Columbus. She is also survived by 11 great-grandchildren. Preceding her in death were her parents, husband, one son, Ervin Schmidt, two sisters; Bernice Wolfe and Iva Graham and a brother, Henry N. Foust.